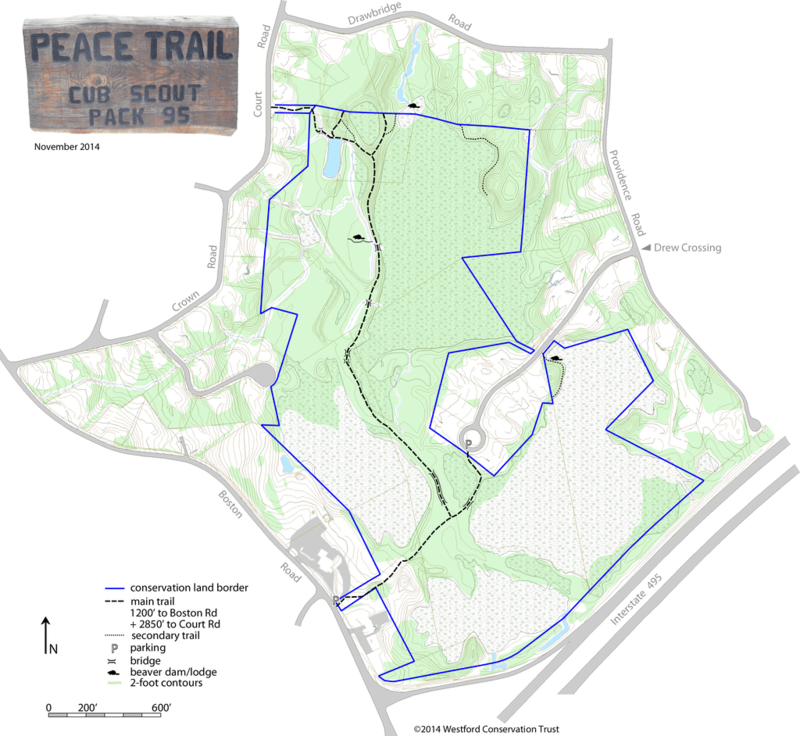 The Peace Trail was named by the boys of Cub Scout Pack 95. In addition to clearing an old trail, they hauled out and disposed of a huge number of tires which were dumped on this land. This land is owned and maintained by the Town, the Westford Conservation Trust, and the Drew Crossing neighborhood. The trail is hilly, but only about a half mile long. It ends at Court Rd. and then one has to retrace the route back to the street. From the parking area, pass between large stands of red sumac (great wildlife food), for a short distance. Soon the trail forks. If you take the right fork, you are headed on a short trail to Drew Crossing. A 50-foot boardwalk, created by Eagle Scout Paul Berard, crosses over the cattail wetland, and is a great place to stand and look for birds. If you take the left fork, you will pass more beaver-created wetland on both sides. The trail passes over a larger 160 foot boardwalk, created by Eagle scouts Sean Dilworth and Michael Basmaji and several smaller bridges created by Eagle Scout Adam Holub. All of these impressive boardwalks and bridges were created by Eagle Scout candidates. The trail climbs up over a large esker, a long thin bank of gravel deposited by the glaciers about 10,000 years ago. From the top of the esker, you can look down on the wetland and in spring and summer you will be amazed at the amount of bird life you see and hear. Huge red oaks dominate the forest here. A trail to the right leads to the beaver dam which created all this abundance. This wetland is actually the origin of Tadmuck Brook, which flows under Drawbridge Rd, to Providence Rd., Leland Rd., Dana Drive, Main St., Cider Mill Pond on Lowell Rd. and into Stony Brook. The trail is well named, because even though the trail is so close to Rt. 495, when entering this lovely nature preserve, one feels one has entered a quiet and peaceful wilderness. This lovely woodland trail lies between Boston Rd., Court Rd. and Drew Crossing, an 87-acre parcel of protected open space. While the farm stand remains unused, the best access point is at the end of Drew Crossing.